Dearest friends, it is the year 2011. Yet, we do not have personalized human cloning that would enable Hidden Number clones to live in your attic and come down to perform the songs from our hit record, Human_Error, for you at your every whim. This is why we have organized for the original, non-cloned band members to leave the Magnet Large & Small dungeon and recording studio–to make a sojourn southward from Seattle, down through the open expanses of Oregon valleys and passes, and then back again. The band must gain these experiences so that we can properly train our future clones. We were pretty surprised and excited about the turnout at the record release back in May. After 4 long and hard years, it was the culmination of a new state of mind for us. We spent that time getting our new band member Josh up to speed and focusing on new material that brought out the strengths of the new lineup. Josh contributed a bunch of melodic guitar parts, while Dean spent time on expressing with his voice exactly what the new paradigm of lyrics demanded. Joe and Kai worked out some super tight rhythm parts to lay a foundation. Then we iterated over all the songs again and again. Honing, building, distilling. I think we were aiming to inject more expression into the music. We didn’t use any sequencing on the parts, and kept it all live. Together, our souls are very turbulent, and over those 4 years we had a lot of ups and downs in our personal lives and with each other while locked in the same room for hours. And that’s what went into the music. So, at the record release, it was pretty rewarding to look out at a packed Comet and realize that this was the moment it was all leading to. We had to inspire. And we heard from folks that it might have been our best performance to date. I felt like we were all in the band together that night, everyone in the room. Yet it was only for those few in Seattle who could make it, and the moment was fleeting. In today’s democratized music business, the only rare thing is performance. All the recordings are free. We can consult the oracle whenever we please. Yet, we still cannot be together. So, we want to come and meet you and play some music and hang out. That is the 2011 Hidden Number Human_Error Tour of 2011. Head over to our music site to hear all the songs for free in advance, get a free download, and read some of Dean’s inspiring lyrics. You can also find out about all the bands we’ll be playing with. First, and foremost Warning: Danger! With these guys rocking, we can all sleep soundly at night. Other bands: Dartgun and the Vignettes, John Wesley Coleman III, Rayon Beach, Los Other Phux, and BioLuminescent Sea Witches. Head over to ReverbNation to listen to most of these bands. We are trying to keep our mobile site up to date so that you can have some useful information on the day of the show, on your mobile device. 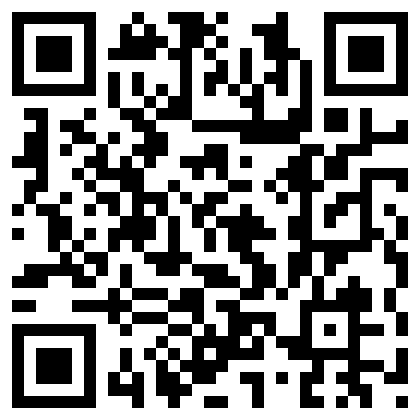 One easy way to visit the site from your phone, is to scan the code that will take you there. We’ll try to update everyone on the progress. You can keep in touch on our facebook page, or through Twitter. Follow @DeanAlanSwanson or @kaiweb. We just created a YouTube channel, and have been posting some videos that feature exerpts from the Human_Error record release performance. We’re going to try to repeat this performance at every stop on the tour, so now you know what to expect! I should also note that we have a bass player filling in for us while on tour–Justin. He’s rad. More on him later. Meanwhile, Joe is moving to a new home with his family and is a top contender for the #1 Dad award on so many levels. It’s a shame we cannot clone him for the tour. And yet, Justin has somehow managed to learn all the songs in record time with a smile on his face–despite at least 4 different emergencies (at least). This guy is a hard worker, and it’s hard to keep up with his creativity. It’s important that you meet him to know what I mean. Your Hidden Number pals are excited to announce an upcoming show that will highlight the three phases of life for human beings: education, workforce, and death. It’s the beautiful and inevitable destiny we all hold dear within our hearts. 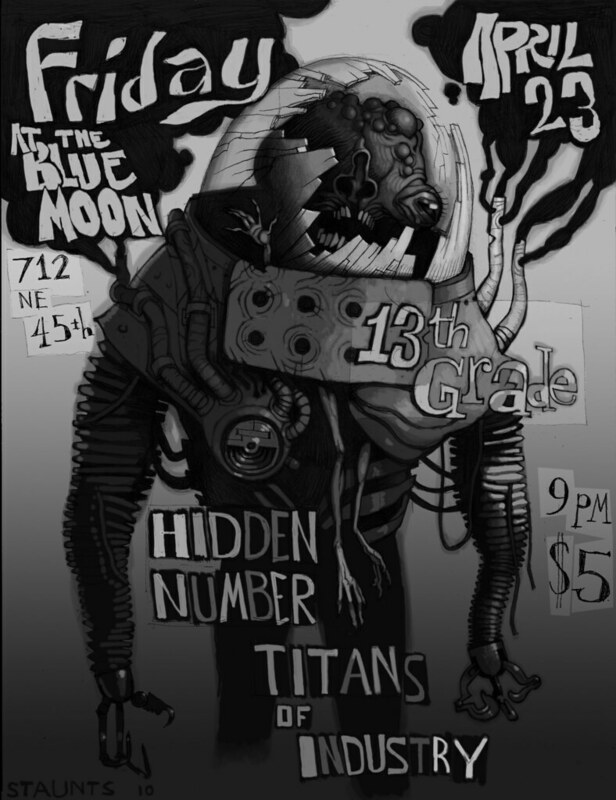 So, come on out to the Blue Moon Tavern, and sing along with our friends 13th Grade and the Titans of Industry, and revel in the human condition. 9pm, $5, 21+. In other news, we changed our website over to http://hiddennumberportal.com, and we’re all gearing up to release our next album near the end of this year. Yes, the momentum is building, and we’re all excited to embrace some new and some old technologies as the music industry continues to evolve. The current plan is to release on vinyl and offer downloads; and then some kind of package with both. We have just a few tracks to go, and then we’ll throw a huge party and everyone’s invited.